University of Phoenix Stadium. Credit: Arizona Cardinals. 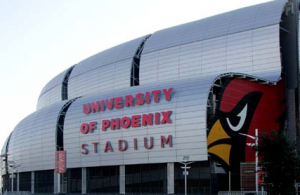 The Super Bowl is once again the stadium Wi-Fi champ, as fans at Sunday’s Super Bowl XLIX in Glendale, Ariz., used 6.23 terabytes of data during the contest, according to the team running the network at the University of Phoenix Stadium. The 6.23 TB mark blew past the most recent entrant in the “most Wi-Fi used at a single-day single-stadium event” sweepstakes, the 4.93 TB used at the Jan. 12 College Football Playoff championship game at AT&T Stadium. Prior to that, pro football games this past season at Levi’s Stadium in Santa Clara, Calif., and at AT&T Stadium had pushed into the 3-plus TB mark to be among the highest totals ever reported. The live crowd watching the New England Patriots’ 28-24 victory over the Seattle Seahawks also used about as much cellular data as well, with Verizon Wireless, AT&T and Sprint claiming a combined total of 6.56 TB used in and around the stadium on game day. All three carriers were on the in-stadium and outside-the-stadium DAS deployments being run by neutral host Crown Castle. If those figures are correct (more on this later) it would put the total wireless data usage for the event at 12.79 TB, far and away the biggest single day of wireless data use we’ve ever heard of. 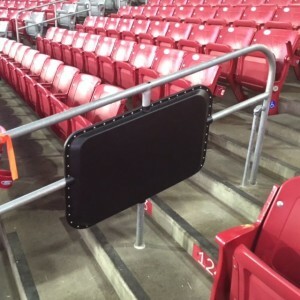 Handrails with Wi-Fi antenna enclosures from AmpThink. Credit: Arizona Cardinals. Mark Feller, vice president of information technology for the Arizona Cardinals, and Travis Bugh, senior wireless consultant for CDW, provided Mobile Sports Report with the final Wi-Fi usage numbers, which are pretty stunning for anyone in the stadium networking profession. According to Feller the new CDW-deployed Wi-Fi network with Cisco gear at the UoP Stadium saw 2.499 TB of data downloaded, and 3.714 TB uploaded, for a total of 6.213 TB of Wi-Fi usage. Bugh of CDW said there were 25,936 unique devices connecting to the network on game day, with a peak concurrent usage of 17,322, recorded not surprisingly at halftime. Peak download usage of 1.3 Gbps was recorded before the game’s start, while peak upload usage of 2.5 Gbps was hit at halftime. The top applications by bandwidth use, Feller said, were Apple (mobile update), Facebook, Dropbox and Snapchat. The only reason we aren’t yet trumpeting the 6.564 TB of reported DAS use as a verified record is due to the differences in clarity from each of the reporting providers. We also haven’t yet heard any usage totals from T-Mobile, so it’s likely that the final final wireless data use number is somewhere north of 13 TB, if all can be believed. 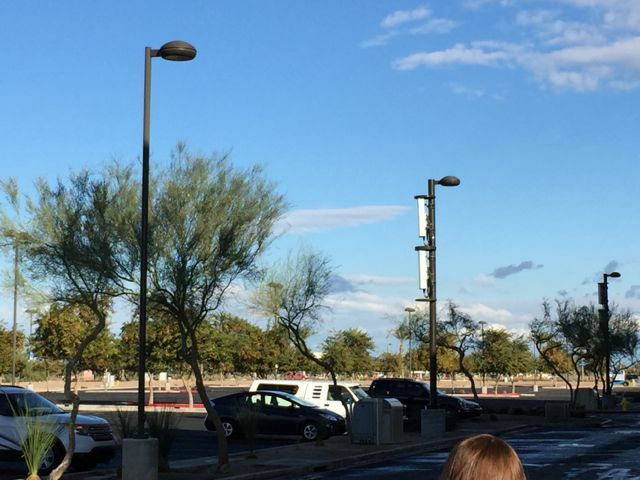 Parking lot light poles, Westgate entertainment district. Can you spot the DAS? As reported before, AT&T said it saw 1.7 TB of cellular wireless activity from its customers on game day, with 696 GB of that happening inside the stadium, and the balance coming from the outside areas before and after the game. We’d also like to welcome Sprint to the big-game reporting crew (thanks Sprint! ), with its total of 754 GB of all 4G LTE traffic used in and around the stadium on game day. 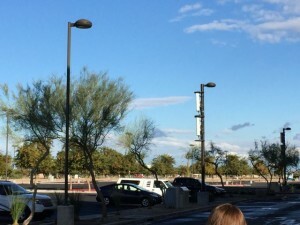 According to Sprint representatives, its Super Bowl coverage efforts included 5 COWs (cell towers on wheels) as well as expanded DAS and macro placements in various Phoenix-area locations. The Sprint coverage included the 2.5 GHz spectrum that uses TDD LTE technology. As also previously reported, Verizon Wireless claimed 4.1 TB of customer traffic in and around the stadium on game day, which Verizon claims is all cellular traffic and does not reflect any Verizon Wireless customer use of the stadium Wi-Fi network. Verizon also reported some other interesting activity tidbits, which included 46,772 Verizon Wireless devices used at the game, of which just 59.7 percent were smartphones. Verizon also said it saw 10 million emails sent on its networks that day, and 1.9 million websites visited, while also seeing 122.308 videos sent or received over wireless connections. We’re still waiting to see if we can get usage numbers from the Super Bowl stadium app (we’re especially interested to see if the instant replay feature caught on) but the warning for stadium owners and operators everywhere seems to be clear: If you’re hosting the big game (or any BIG game), make sure your network is ready for 6 TB and beyond!